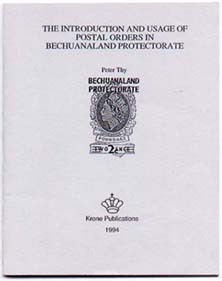 The Introduction and Usage of Postal Orders in Bechuanaland Protectorate. The Macloutsie Post Office and its Postmaster, Bechuanaland Protectorate, 1892. The Northern Mails and Telegraphs: Bechuanaland and Rhodesia in the Annual Reports of the Postmaster-General, Cape of Good Hope, 1885-1909. A Century's Record. Historical Sketch of the Progress of the Cape of Good Hope Post Office to 1907. Postal Orders of Bechuanaland and Botswana. One Frame Exhibit. The Development of Postal Rates in Southern Africa: Annual Reports of the Postmaster-General, Cape of Good Hope, 1882-1909. Philatelic Atlas of the Bechuanalands and Botswana. Krone Publications offer a series of monographs dedicated to the postal history and philately of southern Africa. Have you got a manuscript and looking for an easy way of getting it out to the interested postal history collector? We are actively looking for good and short manuscripts related to the postal history and philately of the greater southern Africa area. Contact us for a discussion. Write to Krone Publications at the address below or email us (thy@kronestamps.dk). The publications are available for the basic production and mailing costs. Pdf versions of many of the titles can also freely be downloaded by going to Krone Publications using the link at left.